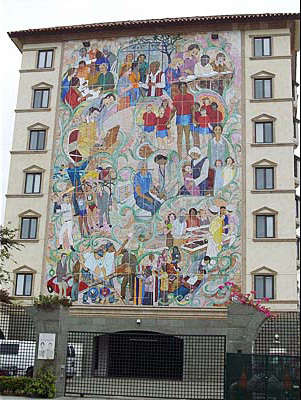 Among the largest works of art of its kind in the world is a 43 feet wide and 72 feet tall glass mosaic mural hanging on the west face of the Villa Harvey Mandel in San Diego, CA. The glass mosaic artwork is one of the last works of world-renowned artist and designer Italo Botti, who died four months before its completion. The mosaic mural was created to celebrate the volunteer spirit of the community, and was completed by Italo’s wife, Mrs. Ethlyn Panzironi Botti, and son, Mr. Christopher Botti, both accomplished artists and designers. Italo Botti was born in Buenos Aires on January 6, 1889, where he studied Fine Arts at the National Academy. As an engraver, he specialized in etching and polychrome variations. He took part in several collective exhibits and was awarded many prizes throughout his career. His work can be found in museums all over Argentina.